Personally, I find the intensive English course is not efficient for the TOEFL exam.Therefore, I looked for a TOEFL course, and I found that Talk English school is one of the few options that has a Complete TOEFL course. Then I decided to enroll in this course. 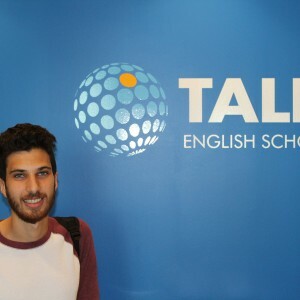 The staff of Talk English school were very helpful, and they provided me with all the information that I needed and not related to their school.First, They gave me websites for housing. It was very helpful, especially that I have a limited budget for housing. Second, they helped me to find a lawyer when I needed one. Finally, they helped to find resources for the other exams that I have to take. Therefore, I can proudly say that the staff of Talk English school are very skilled, supportive and have wide knowledge in the student issues. Besides the skillful staff, my teacher, Roy Frenkiel, is a great teacher. I like my teacher for several reasons. First of all, he is great in teaching. I want to emphasize that because I meet a lot of unqualified teachers during my educational trip, and I can say that he is one of the best teachers I have met. I feel proud that I am one of his students. Another thing is that he is very helpful. Because of his help, I passed the TOEFL exam and the GRE exam in less than one month. it was a lot of hard work for both of us. It was hard work for me because I had to study a lot, and it was hard work for Roy because he had to prepare daily a varies exercises to ensure that I will pass my exams. While I was working hard with my teacher Roy, I attended other classes in the school. The classes that I attended had a really great teachers who makes the studying a fun thing. I enjoyed a lot of their classes and their activities. I wish if I have more time to spend in this school. Usually, After a long day of studying in the school, I enjoyed my time in the awesome place Miami Beach. There are a lot of places to enjoy in this wonderful city. The place that I like most is South Beach where you can swim and play water sports. I have a lot of unforgettable memories from there. At the end, I want to say thank you for this great school for a great TOEFL course and for helping with my success and also for the great time. Content Contributor to TALK English Schools Blog Page.